This first video shows just the results of this extremely exciting project! Watch the first video if you want a quick summary showing the working project. The second video, below shows an in depth step-by-step tutorial on how to make the project work. OK, in the first 14 lessons we were laying the ground work for circuits and programming. Now it is time we had a little fun. This project will show you how to do an insanely cool circuit based on what you have learned already. 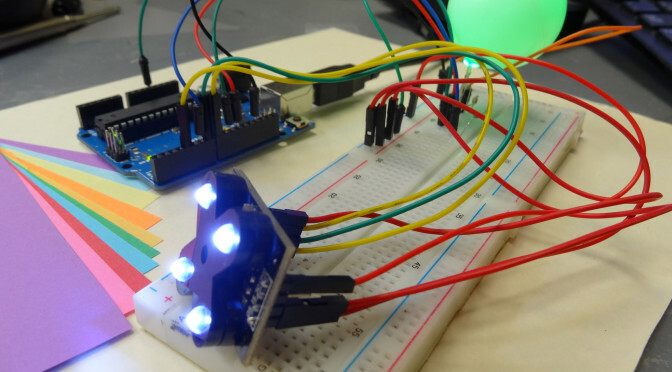 This time we are going to use the RGB LED circuit you worked on in Lesson 13 and Lesson 14, but this time you will set the color based on the color seen by a color sensor! 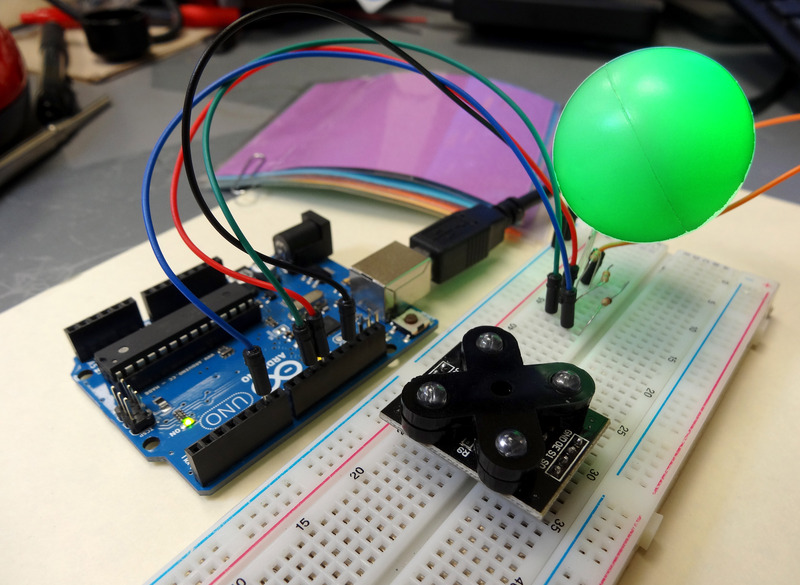 That is right, we will incorporate a color sensor into the circuit. If the color sensor sees red, the LED will turn red. If it sees blue, the LED will turn blue. 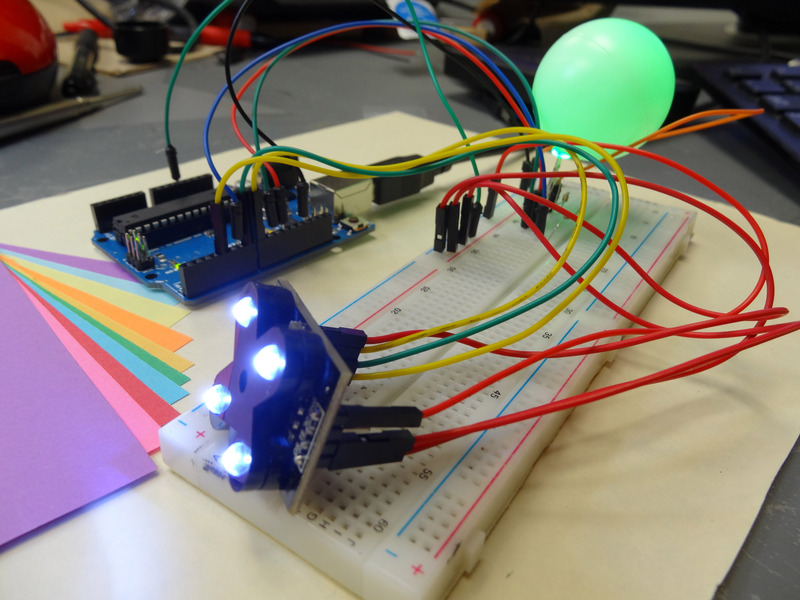 Our challenge in this project is to make the sensor match as many colors as well as possible. There are a couple of things you will need for this project in addition to the arduino, breadboard, and RGB LED we have been using so far. The good news is the components are very affordable and can be easily ordered from amazon. First up you will need the Virtuobotix Color Sensor which you can order HERE. To connect the color sensor to your arduino you will need some male/female connecting wires, which you can order HERE. You probably have the rest of the things you need, but I will give a complete list at the end of this lesson. There are lots of wires, so double check your work against the table above. Now, this is the way the senor works. It will make three different readings indicating the relative “strength” of the three primary colors . . . Red, Green and Blue. Never fear, if you know the strength of the primary colors, you can figure out any color as they will just be different “mixes” of red, green and blue. This measurement will return a value between 0 an 102,400. Because of this, you need to be sure to declare pulseWidth variable an unsigned int. Normal integers can only hold numbers up to +/- 32,768 an unsigned int allows only positive numbers but allows numbers up to 4,294,967,295. The number that is returned which we put in the variable pulseWidth above can be interpreted as such: The lower the number, the stronger the color being read. The larger the number, the weaker the color. That simply adjusts things so that big numbers now mean strong colors. Also, you can see this example would be for reading red. You would need to repeat by setting S2 and S3 to also create gColorStrenght and bColorStrength for green and blue. So, with this little bit of math we should have what we need to actually read R, G, and B values that fairly accurately represent the color the sensor is seeing. In the video I go through the code. I am not posting the code on this one because you need to think through it and if you get stuck, the video shows you each step. This color sensor is so amazing. I am doing a color sensor too which detects red and blue only by using TCS230. I need a clear circuitry including the sensor, may I? It is blurry by just looking at the video. I am using the code which the video is up to around 45 mins which is enough for detecting red and blue. Also I have a question: TCS230 has a pin OE. Why don’t we use the pin? I believe OE is the pin that enables the sensor, so you must connect it to HIGH when you want the sensor to work. I’m trying this with the TCS230 too, so I’ll notice you if that works for me. Did you ever figure this out? I’m also using that sensor and having a bit of trouble. I have OE disconnected and it works fine. hi thanks paul sir for your efforts for this tutorial and Flona Ting the OE pin on tcs230 is a active low pin which enables the sensor for operation u need to connect it to ground.Ialso got cheap one one not getting accurate output. Can you please check amazon.in or ebay.in and suggest me a good colour sensor as I am from India and the Virtuobotix Color Sensor is not available here. Joel, the only one I have experience with is the Virutabotix. The color sensor is a tricky one, and I have had several I could not make work. Sorry I can not be more helpful. Ok Thnx anyway.I will let you know if I get it right with some other sensor. I have got it using a colour sensor I got from a nearby store.Pls tell me what should be the voltage I should be supplying if I am not using my computer and instead using an adaptor of varying voltage between 1.5V to 12V. Can you please send me the details of colour sensor module you got it in India as I m also from India. Please send me on my e-mail as soon as possible! Specifically, I used the Virtuabotix Color Sensor. Thank you very much for your excellent Arduino tutorials! You love what you do and enjoy passing on your knowledge. One question on your clever color sensor project concerning sensor scaling: in the Uno environment a signed integer fits in a two-byte word, occupying 15 bits plus one for its sign. This allows values from -32,768 to +32,767. Wouldn’t type unsigned int still use those two bytes but with the sign bit as value, permitting a range of -65,536 to +65,535? I do not understand how you get to over 4 billion. If this is true then truncation might explain some of the scaling issues that pop up later in your video. After playing with this elegant project some more, I found it helpful to calibrate the RGB Led to produce white light. Since “Green” is always the weak sibling of the three colors Leds can produce, I first turned up “Green” all the way by sending it “255” and then, using the potentiometer, mixed in the correct amount of “Red” to produce exact “Yellow.” I did the same for “Green” plus “Blue” to render the proper shade of “Cyan.” This got me RGB values of 55, 255, and 38, which I use to scale inputs to this particular RGB Led going forward. Do you share your code for this project anywhere on the site? I purchased 2 of this sensor from Amazon and I am getting very unreliable results from the sample code. I go over the code in the video. I make these videos for my high school classes, and show how to do it, but dont want students to just copy and paste code. You should be able to follow the how to on the video. These color sensors can have variations, so you might have to tweak some of the parameters. Also, virtuabotix has some sample code on their site, and you might play with that. Hi Paul,I’m just wondering. What is the name of black parts on the Color Sensor? Is there any website that sell it? That creates a little bit of a pinhole lens. It really is what makes these color sensors work. Dont know anyone who sells them, but that is why I recommend the virtuabotix sensor . . . it comes with them on it. Have you tried icluding S2 HIGH, S3 LOW. This should give you the White Balance and might improve the scaling parameters. I am going to try give it a try when I try this lesson, just to see. is the problem the code or the sensor? I do believe that we need a shield for the photodiode. Which type of voice sensor should I use and how I should it use.I really enjoy your all vedio and learn many things. Please keep moving on for us as motivation . I am not getting rgb led common cathode,would you suggest another type of rgb led.I am from India. Can someone tell me if I can use tcs230 for differentiating between different shades of the color RED? I plan on using this sensor with STM 32 microprocessor to tell whether an apple has reached it’s fully ripened stage or not. I want to know what sort of output will the sensor give and how to interpret the output?? Thank you very much for this tutorials , I have a suggestion..
Hi, Thanks for this tutorial. I have a question for you.. I have a TCS3200 Color sensor… I want to programming with arduino… is Your code same the my color sensor(TCS3200)? Can I take the return R,G,B values from color sensor?When measuring ambient light effective? I’m at vacation for some weeks and I had all the parts that are needed for this but, one part I forgot to bring that was the RGB LED…can I use 3 LEDS instead of the RGB LED? You could not get different colors, each LED would just be whatever color it is, so unless you have a R a G and a B LED, you probably are stuck. what is the applications and future scope of this project?? can we use TCS3200 colour sensor for this project?? The project is pretty much done. The purpose was to teach students, not any particular project. I know the sensor I list works, so am not sure about other ones. Hi, my name is mario, did anyone solved the problem about the 256,256,256 in the serial? I wrote the same code you made on the video. By the way I am using arduino mega I think it should not matter but I am runnin out of options and still cannot figure out what could it be. I show you how to do it in the video! The purpose of the videos is to encourage YOU to learn to write code, not copy and paste. Give it a try, I think you can do it. first thanks for your great videos. On the Uno and other ATMEGA based boards, unsigned ints (unsigned integers) are the same as ints in that they store a 2 byte value. Instead of storing negative numbers however they only store positive values, yielding a useful range of 0 to 65,535. But the Arduino DUE stores a 4 byte (32-bit) value, ranging from 0 to 4,294,967,295. So i guess “unsigned long” should be used instead of “unsigned int”. 256, 256, 256… continuously on the serial monitor. I would request you to suggest a solution for the same. Very informative site across the board. Found it while looking for potential help trying to sense colors to light multiple LEDs. 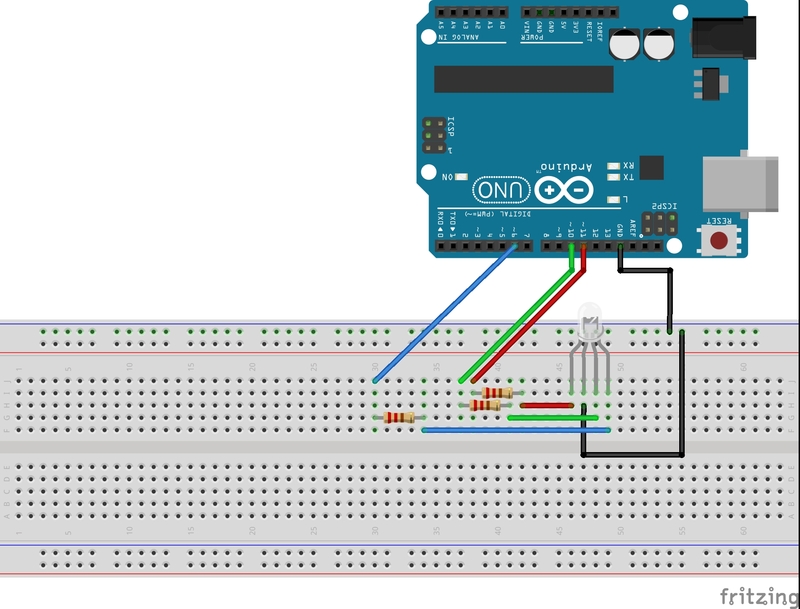 As an absolute beginner is it possible (eventually) to use the sensor/arduino control system in the tutorial to light more than one LED with different colors? I.e. LED #1 could sense red and be lit red; then sense a different color and light another LED# 2 yellow, etc. Thanks. 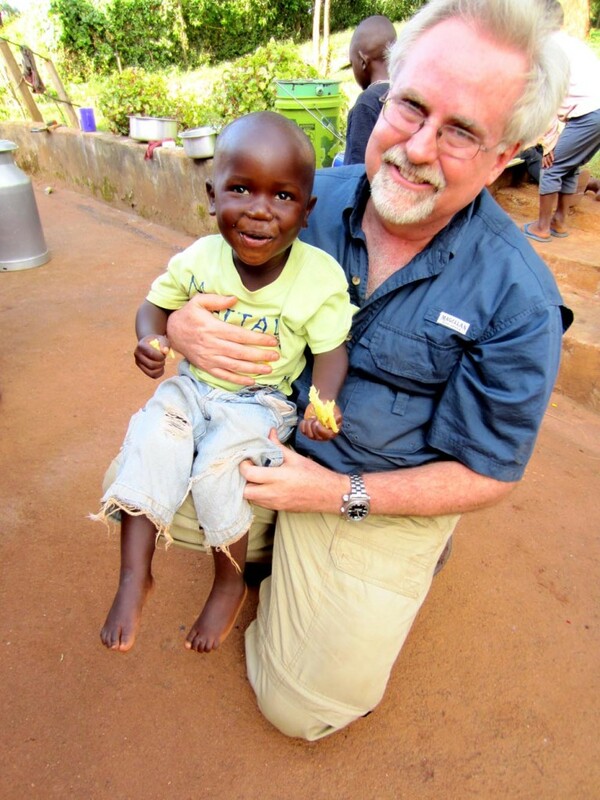 I genuinely admire your hands on approach to a better world. Continue on. I am using rgb common anode led please suggest what changes I should make ?? Will the color sensor detector color on a screen? Also, if mine isn’t detecting unless it is very close, do you have any tips to fix that? Thanks for great quality videos! Nothing wrong with the code . I had the 256,256,256 “problem” as well at first . After some testing I discovered I had used the analog ports on the arduino mega ( A1 -A15) instead of the digital ones ..
Helo sir, im trying to make a colour sensor by using RGB and LDR.. is it the coding will just similar as the sensor that you used? or the LDR will affect the coding program ? can you teach me ? I used the TCS230 and didn’t have any problems. Anyone using the TCS230 that did have problem was not following the video. When you actually compare the TCS230 to the Virtuobotix Color Sensor it’s literally the same sensor. The only difference is, that there is a plastic cap on the Virtuobotix sensor. This probably does help to display colors more accurately, but it worked well enough get the colors and follow the video without it. You can buy this for about $2 shipped on AliExpress. Color changing robotic chameleon is where I can use this in Wow !! Thank you for the tutorials Paul. If you are having problems with values (RGB Reading 255,255,255). It’s because some sensors just return 0-255 values, so dividing /400 it’s not needed. And put “OE” pin to GND. I want to say thanks for the way in which you teach the course material. I feel it’s so important not to skip any steps when introducing new material to learners of every age, especially to old codgers like myself. The internet is full of so called instructors trying to get their point across, but none do a better job of sharing their knowledge than you. It would be very easy to loose a student’s interest when the material learned has to be of a cumulative type. I do have a couple of questions with regards to Lesson 15.
which would produce an Output Scaling of 2%. My question is, where did you come up with the range of 0 to 102,400? My project works as desired, but that number keeps nagging at me like last year’s tooth ache. …. Is there a way to send a private email to you as well? I have a big problem with output values of the sensor shown on serial interface. I trying several time with this codes. But it is shown more than 255 values as a output value.I know it is impossible. Another problem i was faced in colour recognition values. when I put a red paper in front of the sensor, values like this ( 255,358,492). It is shown more value than red colour. i tested it several time with different arduino board and 4 sensor. I can’t fix it up to now. can u help me to sole this problem….? Is that both the pins s1 and vcc of color sensors to be connected to 5v supply? Why those 2 were connected to 5v? this code will work 100%. I’m trying to write code but I can not find the coli bracet on my keyboard. How can I set up code so that the sensor can read any color.